Firstly, can I just say thanks for having me on your blog Jenny! I’m halfway through Brumby’s Run and loving it (if only I didn’t have edits to do and kids to look after, I’d be able to read a lot faster)! Stoked to be here today answering your very diverse questions! I love hearing about Call stories too! They are so inspiring. I’d been subbing to Mills and Boon’s Modern Heat (now RIVA) for almost five years when I FINALLY received an offer to publish my first book. But the offer wasn’t from Mills & Boon. All those years, I’d come close but never quite fitted their exact requirements for the line I was targeting. 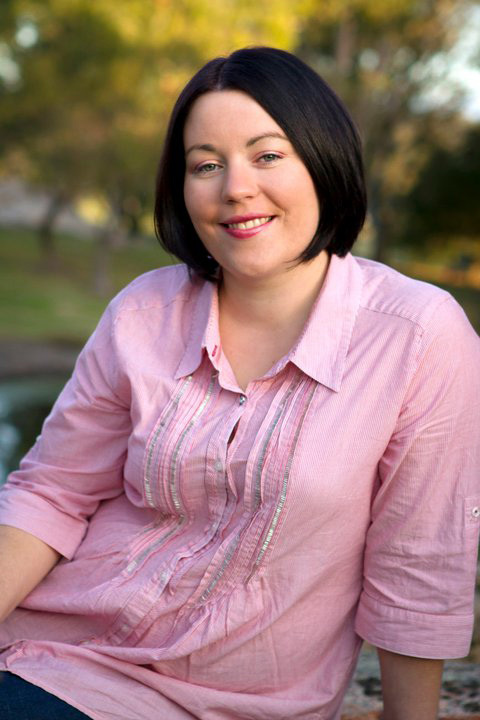 In 2011, I decided to try my luck with Harlequin’s then new digital-first imprint – Carina Press (www.carinapress.com)! Carina’s tagline was ‘Where No Great Story Goes Untold’ and since my last rejection was not on story, but rather not quite making the required sensuality expectations of the line I was targeting, I decided to sub my latest manuscript here. You could have bowled me over with a feather when on April Fool’s Day 2011, I opened my email to find an offer from Angela James (executive editor at Carina) to buy my book! I was on Cloud Nine until a writing friend asked me if I was sure it wasn’t an April Fool’s joke. ARGH, I hadn’t even contemplated that. But it turns out editors may be scary, but they are not cruel. It was real. It’s almost a year since I sold JILTED and it’s been one amazing experience after another. Edits are hell until I’ve handed them in and then it’s exciting to know I have a far better finished product. Reading the blurb for the first time, seeing my cover, actually signing copies of my book – all these things felt kind of surreal and I’m really looking forward to the second time around where I might take more in. Maybe. Since selling JILTED, I’ve sold two more books to Harlequin Australia – MAN DROUGHT will be a January 2013 release! What’s the inspiration behind your latest published novel? JILTED involves the revival of a small town theatrical society, which the hero and heroine inadvertently get conned into being a part of. A few years back when I had a young baby, the town we were living in decided to revive their theatrical society and put on a play for the first time in over a decade. I was gutted I couldn’t be involved (due to baby commitments) because I have a minor in Drama (teaching) and have always been a bit of a Drama Queen. This was right up my alley. Amidst my disappointment, it suddenly struck me that building a novel around a theatrical society might be fun. 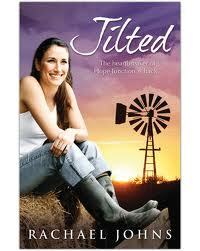 From there, I started brainstorming the characters who would be part of this revival and JILTED was born!! 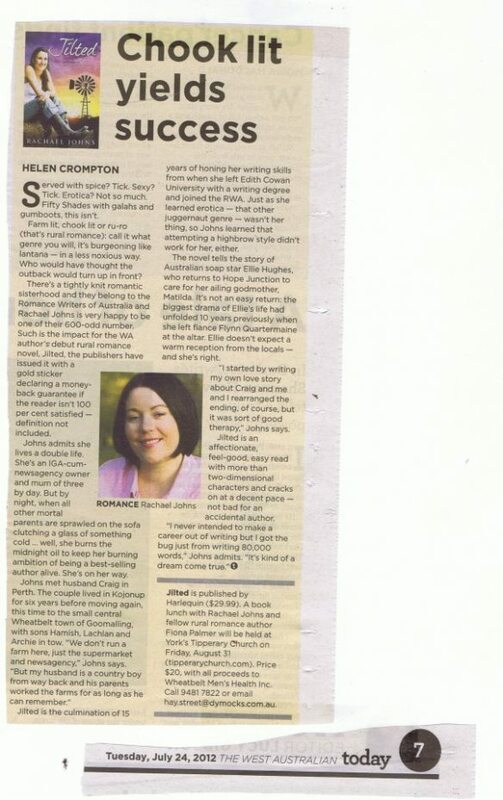 I was lucky the story I LOVED to write fit perfectly into the rural romance genre, which is currently doing so well in Australia. This was a REALLY tough question. Aside from the obvious – my family, my friends and writing, I had to really think. I realised I’m not materialistic. I don’t think there’s any bought possession (aside from books) that I couldn’t do without. I don’t care about owning a flash car or house as long as the first gets me from A to B and the latter has enough room for my books and the people I love in them. What is important to me is MEMORIES – creating special ones for my family and making sure we record them (with photos) if that’s possible. Aside from the kid’s artwork, there’s not art on my walls but there are loads of photos. I feel so happy being surrounded by snaps of the people I love. Some special rituals I’ve created in my little family are board games on a Saturday night, pancakes on a Sunday morning and reading together – not just with my kids, but also with my husband. In such a busy life, setting aside time for these special activities means everything to me. Thanks for that Rachael. It’s been lovely getting to know you better, and I wish you every success for your books in the future! After more than ten years away, Australian soap star Ellie Hughes returns to the small country town of Hope Junction, determined to remain anonymous while caring for her injured godmother, Matilda. But word spreads fast in the tight-knit community. It isn’t long before the people of Hope’s are gossiping about the real reason for Ellie’s visit and why she broke the heart of golden boy Flynn Quartermaine all those years ago. Soon Ellie and Flynn are thrown back together again, forced to deal with the unresolved emotions between them. For Ellie is not the only one with secrets. Flynn has his own demons to battle, and Matilda is hiding something from her much-loved goddaughter. When all is uncovered, can the ill-fated lovers overcome the wounds of their past? Or is Flynn destined to be jilted again?